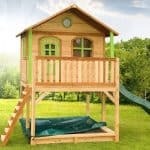 This super sweet log cabin playhouse has a 5x5ft interior and for this reason is particularly suitable for younger children over the age of three. 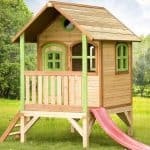 With a solid construction and charming features including window flower boxes this smart looking playhouse has it all. This log cabin has a beautiful alpine style roof and three feature windows with little window boxes. Inside it is light and cosy and there is plenty of room for the children to enjoy it. Constructed from hard wearing and durable wood it looks good in any garden and will last for years. Ideal for boys and girls, but we would not recommend it for children under age 3 years. 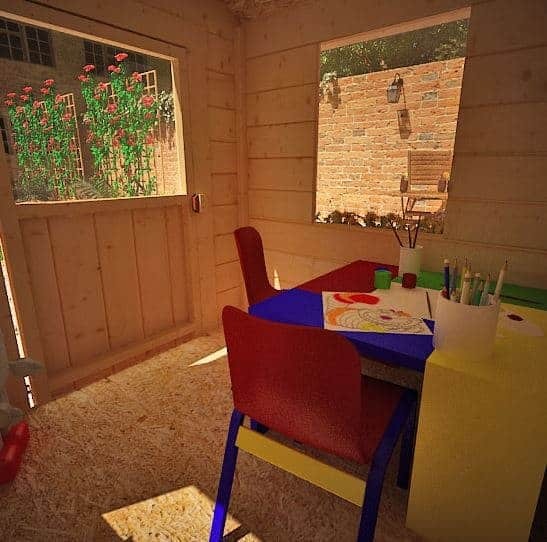 The light timber colour of the playhouse is very attractive and will blend into its natural surroundings easily, however your child may wish to paint the playhouse to personalise it and add a splash of colour to the garden. The windows are large and let a lot of light and fresh air into the playhouse to create a healthy and airy environment in which children can spend many hours. The charming features include window flower boxes and window shutters. The Mad Dash Children’s Wooden Log Cabin Playhouse 5 x 5: How safe is it? When looking to purchase a playhouse for your garden it is easy to see why you may be overwhelmed by the choice available to you. 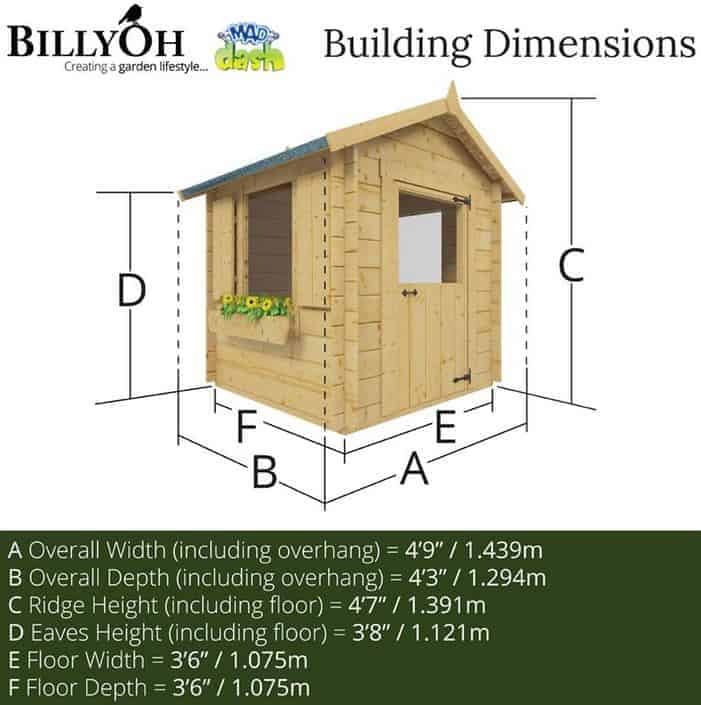 Playhouses of all different sizes, with many different features available, wood and plastic – it is easy to feel a bit confused with it all. In this section the team at whatshed.co.uk take a more detailed look at the Mad Dash Log Cabin playhouse to see how it compares to other playhouses and what it has to offer your child. 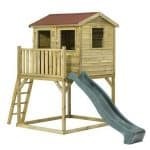 We also address any safety concerns you may have, particularly if you are purchasing the playhouse for a younger child. 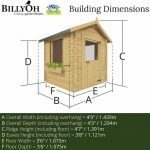 Playhouse: The playhouse has a 5x5ft interior space with a 4ft7 height, ensuring that a small child can comfortably stand up inside. Due to the size we would recommend that the playhouse is most suitable for younger children over the age of three. Windows: The playhouse features four fixed, glazed windows that fill the interior with light. The windows are larger than standard playhouse windows and come complete with fixed shutters. Since both the windows and shutters are fixed, with no open and close function, they prevent any concern that you may have for small fingers becoming trapped. Door: The door is half glazed and half-timber, giving a fantastic open feel to the playhouse and letting parents have a good view inside whilst small children are playing. The door has an ornate handle to allow children to open and close the door carefully. The Mad Dash Children’s Wooden Log Cabin Playhouse 5 x 5: How easy to build? 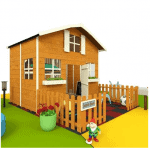 The Mad Dash Children’s Log Cabin playhouse is small enough that one person could potentially build it by themselves, however Mad Dash recommend that a team of two people work on assembly together for safety reasons. The playhouse will be delivered to your door in a flat-packed package, complete with all the panels, glazing, roofing, fixture and fittings needed for assembly. With a basic set of tools and a general knowledge of DIY, we expect that this playhouse could easily be built within a day. The Mad Dash Children’s Wooden Log Cabin Playhouse 5 x 5: What is the overall quality like? 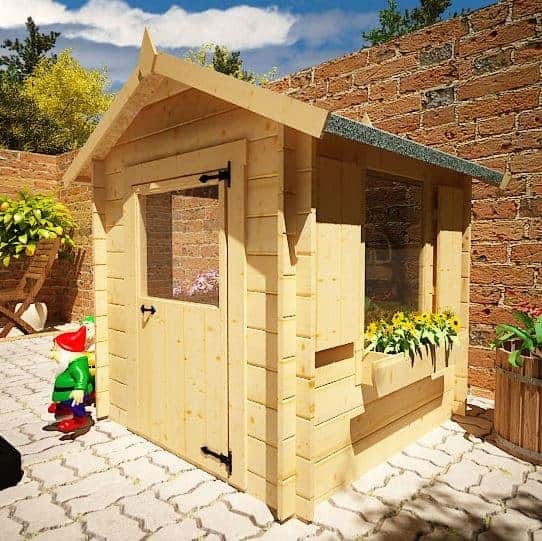 The Mad Dash Children’s Log Cabin has a sturdy structure constructed from 19mm timber cladding, made up of interlocking boards, in an attractive light coloured timber that will blend into the natural surroundings of your garden. It is recommended that a wood preservative treatment be applied upon assembly to ensure longevity of the timber boards. A solid sheet floor will withstand the activity of the playhouse and a solid roof with felt roofing material to provide a weather resistant exterior. If you would like to add a little character to your playhouse, painting your playhouse couldn’t be easier. Paint in multiple colours or a single colour of your choice to create a unique feature for your garden or to simply match existing garden furniture. The Mad Dash Children’s Log Cabin playhouse has a charming log cabin design with a 5x5ft interior that we feel would be most suitable for younger children over the age of three. With interlocking boards and a strong structure, the playhouse is weather resistant against even the harshest of weathers as well as damp, mould and rot. 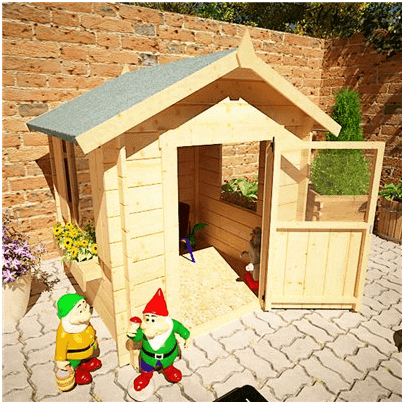 At this price, this model is at the higher end of the price range for playhouses of a similar size, however with its attractive exterior, airy interior and lovely touches such as window boxes and shutters it has much to offer your family. This is very good for me because I work from home and I am outside a lot. I love having my daughter outside with me. This is small enough for her and to where I don’t have to go looking for her. The assembly is only a few steps and can be done by only one person. The price is about right so overall, I am happy with it serving my purpose. The size is the only downfall with this. The assembly took me and my husband to make sure it was put together correctly. I wanted to make sure it was secure for my child. I know just from handling the material that it will with-hold the weather. My son loves running around outside and playing in his new playhouse. Seeing the excitement on his face when he first seen this and when he plays in it shows me that I made a great decision by purchasing it. My son is 4 and if he was any younger, I wouldn’t recommend it just because it’s for children over 3. I love the window boxes and so does my son. He always tells me, “Mommy, I have to go water my flowers now.” It is so cute to watch him pretend and play. Every kid should have a nice imagination and having this playhouse has showed me my son has quite the imagination and he has a blast with it.